Some form of exercise should be a part of every person’s daily routine. With the warm weather still holding strong, there’s no better time to be outside, breaking a sweat, and soaking up some sun. It’s an even greater time to start exercising and enjoying physical activity with your pet. Before exercising or performing any sort of physical activity with your pet, always make sure that you both hydrate. In this scenario, your dog is not only your best friend, he’s also your workout partner. You will laugh, push each other, overcome challenges, and support one another on your way to having a fun and meaningful workout. With this in mind I will breakdown some fun summer excise ideas that you can enjoy with your pet. By far one of the easiest ways to exercise with your pet is going for a walk. Just like you’re sitting at a desk all day, your dog is sitting on its pillow. Get outside while the weather is still nice and hit the pavement. Add some difficulty to your walk by adding some hills or stairs into the mix. Hiking is also a great way to make your outdoor walk more exciting. The terrain will offer unique challenges to both you and your dog – elevating that heart beat and breaking a sweat. Be careful when hiking and always make sure pets are permitted. If you want to go one step further (pun intended), then start running. 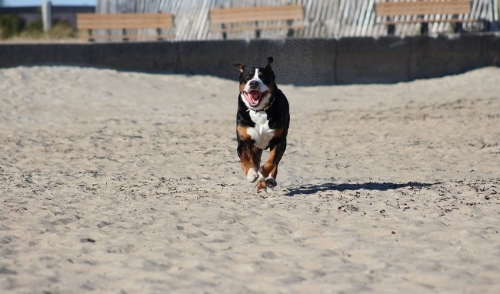 Some cool places to run with your dog include the park, the local stadium bleachers, the beach, or even a charity race. Another great idea to that you can try to exercise with your pet is cycling. This is a great exercise for dogs that are exuberant and carry a lot of energy. Your pet will work to keep up with you as you pedal while you build stronger quads. Other cool ways to get some light exercise on the road or at a nearby park are rollerblading or skateboarding. If your dog has some skills, maybe you’ll be the one on foot and he will be on the board. This time of year is a great time to take a dip with your pet. Swimming not only provides exercise, it also gives you both relief from the heat. Swimming is great for older dogs as its low impact and can get your dog the exercise it needs without putting strain on aging joints and muscles. If you’re more traditional, fetch is a classic method for pets to get some exercise and can take place just about anywhere. From your living room to the local football field, fetch never fails to provide fitness and quality bonding time between pet and owner. When out and about with your pet, always be mindful of your surroundings and the environment. Look out for unsafe situations like high temperatures and fields or water that have been heavily treated with chemicals. Make sure both you and your pet have access to everything you’ll need to engage in physical activity safely. Dogs make the best workout partners. Get outside and try these activities with your pet before it’s too late.